Three little rhinos just can’t seem to behave. Whether they’re at the dinner table or in the tub, the three little rhinos keep pushing, fighting, tussling, and butting heads until it turns into a full blown RHINO RIOT! Mama Rhino is getting tired. Will the three little rhinos ever get along? 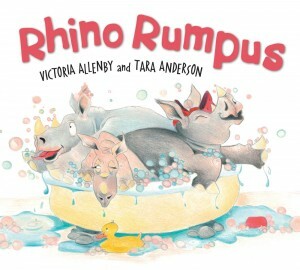 Thanks to its bubbly rhythm, Rhino Rumpusis a great candidate for story time with toddlers. The energetic language and rhymes are made to be read aloud and the illustrations are equally as exciting and expressive. Preschoolers with siblings (or parents with rambunctious little rhinos of their own) will relate to this story and have a lot of fun reading together. This romp of a picture book for very young audiences begs to be read aloud. The plot is fairly simple: a trio of squabbling rhino siblings can’t quite manage to get ready for bed…The rhyming text incorporates numerous exclamations and sound effects. Adult readers should be prepared to harrumph, gripe, snipe, grumble, and roar. The pencil-and-crayon illustrations do an effective job of conveying the mayhem, and the facial expressions add to the general hilarity. While this would be a great choice for library storytime, it’s not really recommended for bedtime [because] most young readers will be way too riled up.